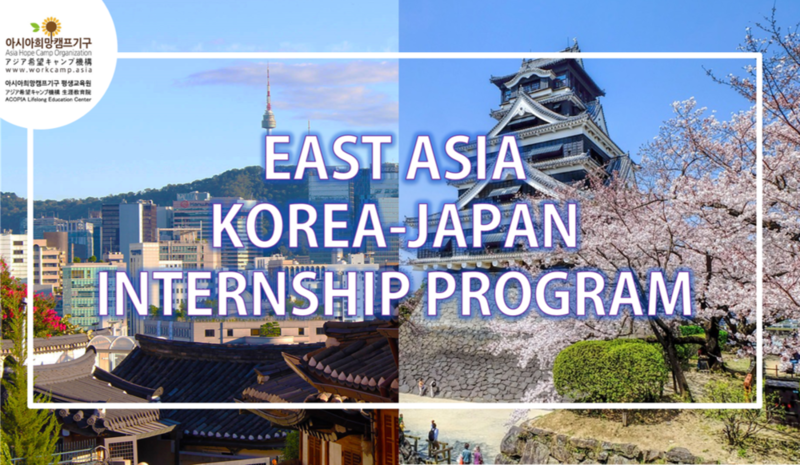 The Korea-Japan internship program is a non-paid internship organized by the Korean NGO Asia Hope Camp Organization, and by the Japanese NGO Acopia Friendship International. Are you looking for a working experience in Asia? To travel in Korea or in Japan? To learn a new language or discover East Asian culture? Perhaps all three at once? If your answer is "Yes!" to any of these questions, our Korea-Japan internship program is exactly what you need. They will stay a total of 20 days in Kumamoto, Japan (fixed duration) from the second day of any month. The internship starts in Seoul and ends in Kumamoto! Remember Kumamoto as your second hometown! After your stay in Kumamoto, you will be asked to hand in a little review of what you did in Kumamoto, what you learned and how the volunteering program has made you felt. This will include 5 pictures or more that you have taken of your favorite places, foods, people and experiences you have had in Kumamoto. ※Water, electricity and gas, wifi included. Interns will be using a Double Room on their own. The rent is 800 USD / month. Administrative fee Japan: 5000¥ (45 USD). To be handed over in cash directly to the Kumamoto City International Center. 2. Send your resume and a cover letter by email at acopia.intern@gmail.com. ACOPIA don't sponsor or issue VISA but can send you and invitation letter and the business registration certificate for you to apply for one. I will make sure contact the Korean and Japanese embassies to make sure that you can get them before applying.